A newly built villa on 210 m2 that is hidden in the beautiful hills surrounding Vence, the house has a splendid view stretching over the Mediterranean Sea, beyond the red Esterel Mountains, the sunset colouring the swimming pool at night with reflections from the stars and mountains. In the garden you find palm and olive trees, trampoline, monkey bars, swings and slide. The pool can be heated from app May to October, in summer it has around 28C. The property is surrounded by a fence and a gate, so no trespassing possible. A big parking on the land is available, so your car is totally safe. The villa offer 5 bedroom, 3 bathroom with shower/tub and wc. 2 bedroom have a mezzanine with double beds. Air conditions and shutters in all room! The bath rooms and all floors are tiled with marble, it is a real joy for the eyes. Luxury bath and kitchen furniture which makes it an unforgettable stay. Profit from the SONOS soundsystem, the LCD TV 66” in the Cinema with Astra Sat. 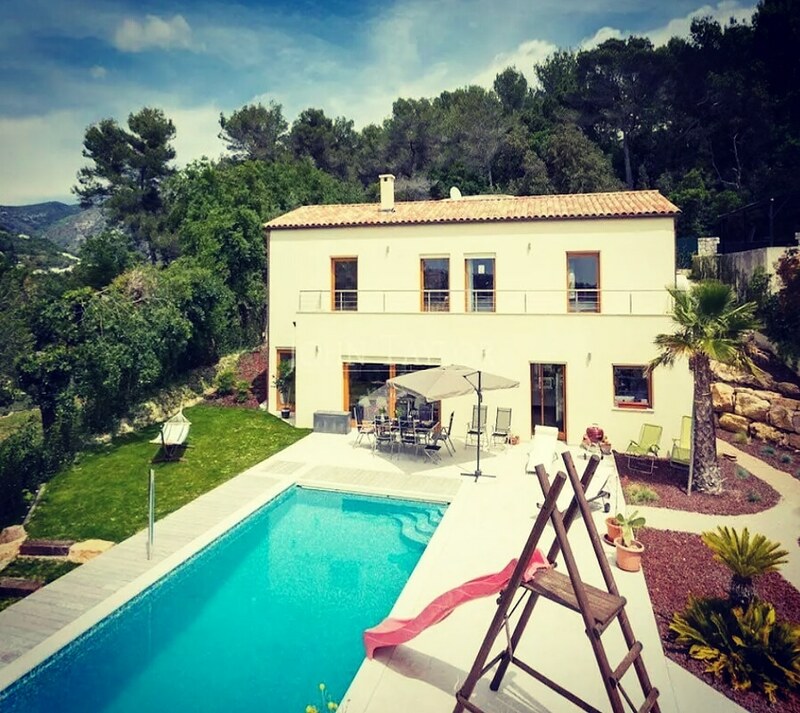 There is a large living room on 65 m2 with integrated kitchen and terrace overlooking Cap Antibes, The Esterel Mountains, St Paul de Vence, Old Vence and The Med. For a fairytale holiday! Vence is located at the famous Côté d’Azur, 15 km from the Nice Cote d’Azur International airport. The villa is 5 minutes drive from the center of Vence, in quiet and green surroundings. Away from the busy coast line – but still close by. Your kids will love the water slide into the pool, Have fun with the pool waterfall and enjoy a hot shower outdoor solar shower afterwards. Close by you find perfect conditions to go hiking, climbing, rafting or just swimming in natural pools with spectacular water falls. It is only a short walk to the cool green rivers of Vence. Vence offers lots of forest and water. Great location with easy access to Vence and a short drive to all beaches from Monaco to Cannes. You need to explore the Vieux Nice (Old Nice), Saint Tropez is worth a day trip. Did you know that the famous painters like Matisse lived in Vence? You can visit his Chapelle in Vence. Would you like to book this place?